It has been a busy week for NFL Media in both Atlanta, where Super Bowl LIII will be played this weekend, and Culver City, CA. 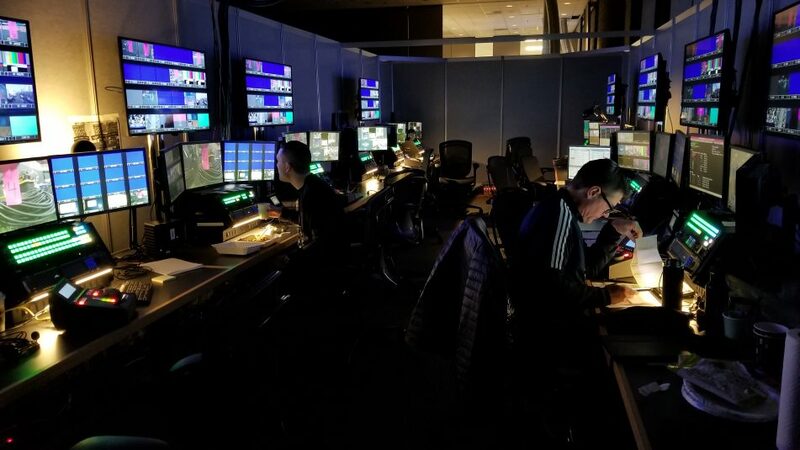 In Atlanta, a team of more than 400 is covering every angle ahead of the game and working closely with a team of more than 250 people at NFL Media’s facilities in Culver City, where three control rooms have been producing all the coverage for programming from Tuesday to Saturday. And new this year, a fourth control room will be fired up on Sunday for the big game. For the NFL team, each year provides its own set of challenges and opportunities because each host city is unique. Atlanta has arguably provided the most compact Super Bowl footprint in quite some time. 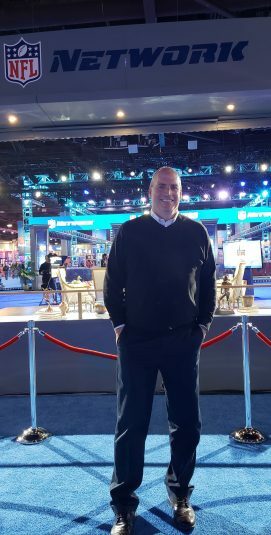 NFL Media’s Dave Shaw says the team in both Atlanta and Culver City, CA, has done a great job this week for Super Bowl LIII coverage. The close proximity gave Shaw and the team a chance to build a 25,000-sq.-ft. production hub within the GWCC. Bexel was tapped to supply and engineer a prebuilt system customized for NFL Media’s engineering core, transmission hub, and control room. The only standalone production is NFL Honors, with Game Creek’s Apollo supporting NFL Media’s coverage of the red-carpet show. The team in Culver City is working closely with the team in Atlanta and makes sure the intercom system (a massive RTS Adam intercom with 880 ports) and all other signals get to the right location. When nasty weather hit Atlanta on Tuesday and production plans had to be adjusted for programs set to shoot in Centennial Park, for example, ensuring communication between the team in Culver City and the one in Atlanta was critical. NFL Media studios and sets in Atlanta comprise a presence in Centennial Park; a two-way set on the floor of NFL Experience; a Total Access set; four positions in the Media Center for the linear network, digital, social, and original content; and a set along one of the primary thoroughfares the fans will take to reach the stadium. Filmwerks was tapped for set structure, intended to highlight the looks of Super Bowl Experience, Super Bowl Live in Centennial Park, Media Center Radio Row, and an outside set near Fan Plaza. Inside the stadium, there is a set on the field level as well as in Section 119, where a coaches show, a Twitter show, and a digital postgame show will be produced. And, on Monday morning, Good Morning Football will set up shop with the stadium as a backdrop. The NFL is relying on one truck in Atlanta: Game Creek’s Nitro, which will be used for the production of the NFL Honors on Saturday night from the Fox Theater. This is the third year the team at the game has made use of the at-home approach to produce content. But it’s the first year that Bexel is involved, providing the equipment, integration, and technical support to keep the production-control room, audio area, EVS replay-playback area, and graphics area are online and operating properly. 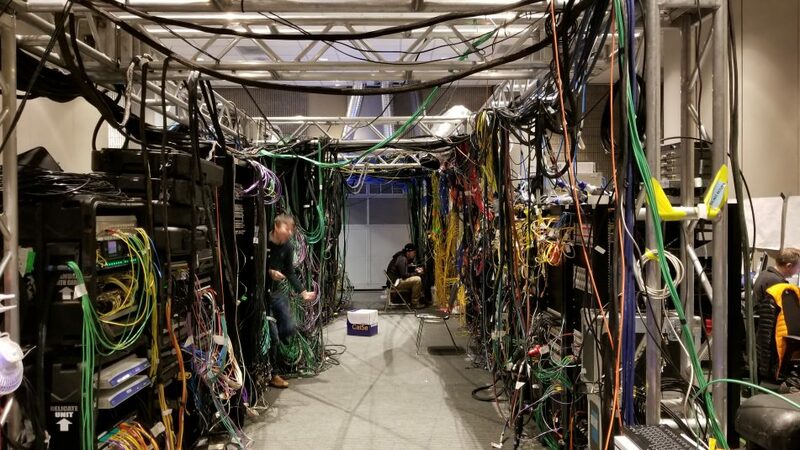 Bexel made use of furniture from NEP in building the NFL Media production-control room at Super Bowl LIII. Shaw and the team put the contract for technical facilities out to bid this year, and part of the process included having the finalists construct a dummy of the facility in Los Angeles. 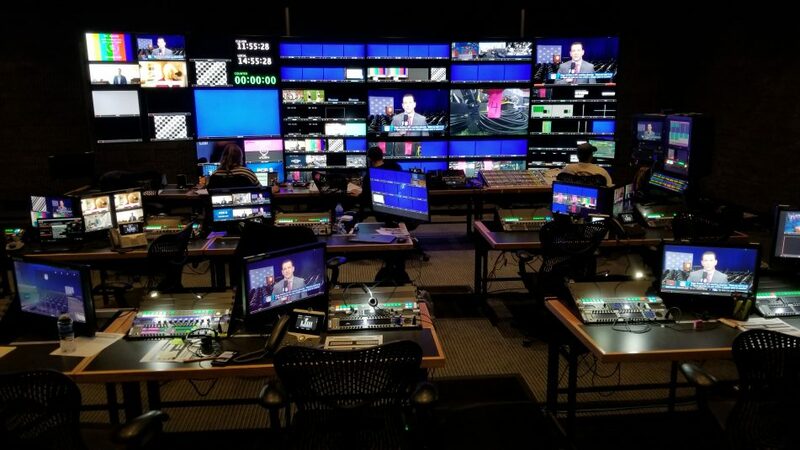 That gave the NFL production and operations team a chance to see what the facility would look like and also make adjustments, such as adding a path down the middle of the production-control room, which will seat 15 people on Super Bowl Sunday. Because Bexel is now part of NEP Group, its team was able to leverage the rest of the NEP team. From left: Richard Lancaster, Kevin Reilly, and Johnny Pastor worked closely together to develop the layout and technical plan for NFL Media’s 25,000-sq.-ft. facility supporting Super Bowl LIII efforts. Working and planning the remote-engineering detailed plan with Bexel’s team was NFL Media Technical Manager Kevin Reilly, who worked on every detail with Bexel VP, Technical Services, Johnny Pastor, and NEP UK Technical Manager Richard Lancaster. NFL Media, VP, Engineering, Bruce Goldfeder helped oversee the engineering plan and coordination from the Culver City side of this intricate plan, which incorporates remote feeds to three control rooms, along with Team Cam (Azzurro), TVU bonded-cellular signals, file transfer, and intercom and tally swings. The furniture was also much more shipping-friendly, notes Pastor, and much of it was used for Eurosport’s Olympics efforts and for Wimbledon’s new technical facilities, which debuted this past summer. The large footprint within the World Congress Center ballrooms provides space for 65 pieces of furniture and ample space for technical equipment and the ability to work with a bit more personal space than is typically found in a live-production environment. A large EVS replay area gives NFL Media production-team members plenty of room to do their job. The technical specs were large as well and have been achieved with the help of a 1,000×1,000 Imagine IP3 router, which Pastor says has 30 multiviewer cards with 48 inputs and six outputs each. There is also a Grass Valley Kayenne production switcher with 9M/E and 128 inputs; a Calrec Apollo audio console with 96 faders alongside a Calrec Artemis 64-fader console; and two Vizrt graphics engines. The at-home–production rooms house two Calrec Apollo consoles with 40 faders. There are also five eight-channel EVS system and two 12-channel EVS servers, as well as 880 intercom ports on three Adam matrixes tied to a fourth in Culver City. “We’ve basically built a TV station that is supporting a network,” notes Reilly. He adds that there are also 528 strands of fiber between the Atlanta sites, including 198 to the stadium and 96 to State Farm Arena. The biggest challenge was simply to have all the production racks and furniture prebuilt and planned so that they could quickly be brought onsite and put together. One idea that helped ease operations was to build a truss in the main equipment room. Lancaster had built something similar for Wimbledon, and the truss at the World Congress Center sits between two rows of equipment and allows the cables to pass overhead. A truss in the NFL Media technical area makes it easier for staffers to access the back of units and minimizes trip hazards. The truss and preplanning enabled the technical team to move in at 5 a.m. on Sunday, get the truss up by 7 a.m., power up by 8 a.m. and have eight trucks of equipment unloaded in one day. The digital and social-media teams were also able to take advantage of the infrastructure. “They were able to access the same infrastructure to support its unique programming from the various set locations, along with bandwidth for them to do their own encoding,” says Shaw. And the NFL Films core group engineering team — led by Director, Broadcast Engineering Services, Mike Greenwood; Director, Systems Engineering, Kevin Clifford; and VP/Executive in Charge of Production Operations Jeremy Swarbrick — manages feeds to and from the CBS main compound, the NFL international clean broadcast, and the various domestic and international groups broadcasting from Atlanta. Separately, NFL Films audio team captures the “wires,” with engineering led by VP, Engineering, Rich Markowitz; Director, Locations Sound, Scott Carter; Audio Engineer Ron Schrier.